For the second year in a row, classes have been canceled due to snow. Best of all, most of the snow is coming during the day, when I’ll be awake to enjoy it. 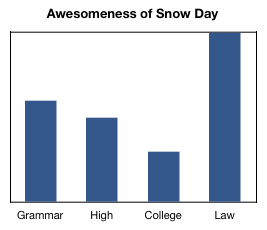 In the meantime, please review my scientific proof explaining how awesome snow days are. The awesomeness of a snow day [UPDATED FOR 2010] is directly proportional to how much you expect it to happen. For instance, as a wee child, you expect the heavens to issue a salvo of powdery white “Get Out of Doing Homework Free” cards upon command. I mean, you begged and pleaded for those Teenage Mutant Ninja Turtles action figures, and that worked, right? It has to work for some snow: snow is free!